Sustainability. Flexibility. Economy. These are the concepts we embrace as we strive for excellence through innovation and technological leadership. At Fluence, we’re invested in the emerging concept of distributed water management, which essentially means the right water treatment at the right place, at the right scale — and at the right price. Recent developments in automation and communication technologies are allowing us to break new ground in decentralized treatment systems that feature lower infrastructure and operating costs. Distributed water management is just one aspect of our resource-efficient attitude toward technological development. As we go forward with an emphasis on energy and water sustainability, the recovery of resources from wastewater will be playing an even greater role. At the heart of our mission to create a better world through ongoing technological innovation is our global patent portfolio. At Fluence, we see intellectual property as an important aspect of technological development. Our patents extend across a wide range of treatment facets, including aeration, biofilms, sludge, mixing, energy efficiency, bioreactors, treatment processes, and product components. We’re also working to standardize essential features of wastewater treatment to allow for standardized specification of energy consumption and energy efficiency. In the field of biological wastewater treatment, we’ve just developed and launched the innovative and energy-efficient Membrane Aerated Biofilm Reactor (MABR), and we’re continuing to work on our Electrogenic Bio Reactor (EBR). 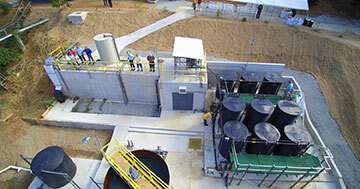 For over a century, activated sludge treatment has been a mainstay of conventional aerobic wastewater treatment. But it’s complicated, and its aeration stage is particularly energy-intensive, making it impractical for wastewater reuse. At Fluence, we’ve developed an alternative: self-respiring Membrane Aerated Biofilm Reactors (MABR). 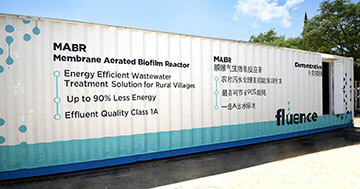 MABR is an especially energy-efficient biological wastewater treatment process based on passive aeration, that is, the diffusion of oxygen through membranes. Low-pressure air is blown through a spirally wound flat-sheet membrane, which is exposed to wastewater on the other side. The wastewater is continuously fed into a tank containing the spiral. 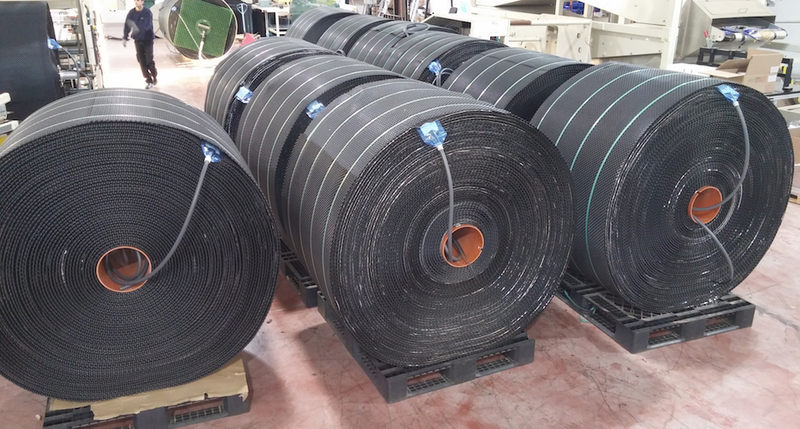 Rolls of membrane await installation in Membrane Aerated Biofilm Reactors for the technology’s first commercial installation in 2015. During the process, an aerobic nitrifying biofilm develops on the surface of the membranes, and suspended solids are held in the mixed liquor (as in the integrated fixed-film activated sludge (IFAS) process). This combination enables simultaneous nitrification and denitrification (SND), which minimizes carbon deficiency and results in low total nitrogen in the effluent. Fluence’s MABR technology allows for simultaneous nitrification-denitrification and uses passive aeration, which is much more energy-efficient than the compressed-air aeration used in conventional treatment. 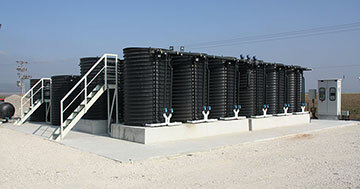 MABRs are ideal for small- to medium-sized wastewater treatment plants. The patented passive aeration process saves energy by eliminating the need to blow compressed air into the water, and MABR is scalable: Modules can be connected in parallel to meet treatment requirements. MABR allows for localized water reuse, which is much more economical than the conventional approach of pumping effluent to a centralized wastewater treatment facility. Fluence has deployed the MABR technology in several wastewater plants around the world. In 2016, the first installations were successfully commissioned in Israel’s Valley of Jezreel and on St. Thomas, U.S. Virgin Islands, while additional projects are being implemented in Ethiopia and China. Operational results show that MABR’s effluent quality — including nitrogen removal requirements — can easily be maintained for a length of time. For example, the Bordeaux plant in St. Thomas, which uses MABR for its secondary treatment, produces water with less than 10 milligrams per liter of total suspended solids (TSS), biological oxygen demand (BOD) and total nitrogen (TN). Results also show that energy consumption for secondary treatment is less than 0.2 kilowatt-hours per cubic meter. The energy requirement for the entire treatment train — including primary treatment and tertiary treatment — is less than 0.4 kilowatt-hours per cubic meter. These are low values even for a large plant, but they’re exceptionally low for a small plant. Are you looking for cutting-edge solutions for your water and wastewater treatment needs? At Fluence, our experts can help you find the ideal technology to meet your requirements with an emphasis on economy and sustainability.